Before the compilation of sales of records, the music market measured a song's popularity by sales of sheet music. The idea of compiling a chart based on sales originated in the United States, where the music-trade paper Billboard compiled the first chart incorporating sales figures on 20 July 1940. Record charts in the UK began in 1952, when Percy Dickins of the New Musical Express (NME) gathered a pool of 52 stores willing to report sales figures. For the first British chart Dickins telephoned approximately 20 shops, asking for a list of the 10 best-selling songs. These results were then aggregated into a Top 12 chart[nb 1] published in NME on 14 November 1952, with Al Martino's "Here in My Heart" awarded the number-one position. The chart became a successful feature of the periodical; it expanded into a Top 20 format on 1 October 1954, and rival publications began compiling their own charts in 1955. Record Mirror compiled its own Top 10 chart for 22 January 1955; it was based on postal returns from record stores (which were financed by the newspaper). The NME chart was based on a telephone poll. Both charts expanded in size, with Mirror's becoming a Top 20 in October 1955 and NME's becoming a Top 30 in April 1956. Another rival publication, Melody Maker, began compiling its own chart; it telephoned 19 stores to produce a Top 20 for 7 April 1956. It was also the first chart to include Northern Ireland in its sample. Record Mirror began running a Top 5 album chart in July 1956; from November 1958 onwards Melody Maker printed the Top 10 albums. In March 1960, Record Retailer began compiling an EP (album) chart and had a Top 50 singles chart. Although NME had the largest circulation of charts in the 1960s and was widely followed, in March 1962 Record Mirror stopped compiling its own chart and published Record Retailer's instead. Retailer began independent auditing in January 1963, and has been used by the UK Singles Chart as the source for number-ones since the week ending 12 March 1960. The choice of Record Retailer as the source has been criticised; however, the chart was unique in listing close to 50 positions for the whole decade. With available lists of which record shops were sampled to compile the charts some shops were subjected to "hyping" but, with Record Retailer being less widely followed than some charts, it was subject to less hyping. Additionally, Retailer was set up by independent record shops and had no funding or affiliation with record companies. However, it had a significantly smaller sample size than some rival charts. "I Believe" is a popular song written by Ervin Drake, Irvin Graham, Jimmy Shirl and Al Stillman in 1953. "I Believe" was commissioned and introduced by Jane Froman on her television show, and became the first hit song ever introduced on TV. Froman, troubled by the uprising of the Korean War in 1952 so soon after World War II, asked Drake, Graham, Shirl and Stillman to compose a song that would offer hope and faith to the populace. Froman's commercial recording reached No. 11 in the Billboard charts during a 10-week stay. "I Believe" has been recorded by many others, and has become both a popular and religious standard. Frankie Laine's version spent eighteen non-consecutive weeks at the top of the UK Singles Chart. Laine also had the most successful version in the USA, where he reached #2 for three weeks. "I Remember You" is a popular song about nostalgia with music by Victor Schertzinger and words by Johnny Mercer, and first released by Jimmy Dorsey in December 1941.The song was one of several introduced in the film The Fleet's In (1942). It was sung in the film by Dorothy Lamour. "It's Only Make Believe" is a song written by Jack Nance and American country music artist Conway Twitty, and produced by MGM Records' Jim Vienneau, released by Twitty as a single in July 1958. The single topped both U.S. and the UK Singles Chart, and was Twitty's only #1 single on the pop charts of either country. On a segment of Pop Goes The Country, Twitty states the single was a hit in 22 different countries and sold over 8 million copies. It is believed that Twitty wrote his part of the song while sitting on a fire escape outside his hotel room, to escape the summer heat, in Hamilton, Ontario. Twitty had gone to Canada on the advice of another American singer, Rompin' Ronnie Hawkins, because Hawkins had told Twitty that Canada was the 'promised land' for music.Twitty recorded many subsequent versions of "It's Only Make Believe", including a 1970 duet with Loretta Lynn on their very first collaborative album, We Only Make Believe. Twitty joins in on the last verse in a 1988 uptempo cover by Ronnie McDowell, which was a #8 hit on the country music charts. Additionally, Twitty contributed to an alternative cover by McDowell. The UK Singles Chart is the official record chart in the United Kingdom. Record charts in the UK began life in 1952 when Percy Dickins from New Musical Express (NME) imitated an idea started in American Billboard magazine and began compiling a hit parade. Prior to this, a song's popularity was measured by the sales of sheet music. Initially, Dickins telephoned a sample of around 20 shops asking for a list of the 10 best-selling songs. These results were then aggregated to give a Top 12 chart published in NME on 14 November 1952. The number-one single was "Here in My Heart" by Al Martino. According to The Official Charts Company and Guinness' British Hit Singles & Albums, the NME is considered the official British singles chart before 10 March 1960. However, until 15 February 1969, when the British Market Research Bureau chart was established, there was no universally accepted chart. Other charts existed and different artists may have placed at number one in charts by Record Mirror, Disc or Melody Maker. Alternatively, some considered BBC's Pick of the Pops, which averaged all these charts, to be a better indicator of the number-one single.In terms of number-one singles, Frankie Laine, Guy Mitchell and Elvis Presley were the most successful artists of the 1950s having four singles reach the top spot. The longest duration of a single at number one was eighteen weeks achieved by Frankie Laine's "I Believe". As of July 2010, "I Believe" still holds the record for the most (non-consecutive) weeks at the top of the UK Singles Chart. Although official music recording sales certifications were not introduced until the British Phonographic Industry was formed in 1973, Disc introduced an initiative in 1959 to present a gold disc to records that sold over one million units. Prior to that it is believed that the three best-selling records of the decade—Bill Haley & His Comets' "Rock Around the Clock", Paul Anka's "Diana" and Harry Belafonte's "Mary's Boy Child"—all sold over one million copies. The UK Singles Chart is the official record chart in the United Kingdom. Prior to 1969 there was no official singles chart; however, The Official Charts Company and Guinness' British Hit Singles & Albums regard the canonical sources as New Musical Express (NME) before 10 March 1960 and Record Retailer from then until 15 February 1969 when Retailer and the BBC jointly commissioned the British Market Research Bureau (BMRB) to compile the charts. The choice to use Record Retailer as the canonical source for the 1960s has been contentious because NME (which continued compiling charts beyond March 1960) had the biggest circulation of periodicals in the decade and was more widely followed. As well as the chart compilers mentioned previously, Melody Maker, Disc and Record Mirror all compiled their own charts during the decade. Due to the lack of any official chart the BBC aggregated results from all these charts to announce its own Pick of the Pops chart. One source explains that the reason for using the Record Retailer chart for the 1960s was that it was "the only chart to have as many as 50 positions for almost the entire decade". The sample size of Record Retailer in the early 1960s was around 30 stores whereas NME and Melody Maker were sampling over 100 stores. In 1969, the first BMRB chart was compiled using postal returns of sales logs from 250 record shops.In terms of number-one singles, The Beatles were the most successful group of the decade having seventeen singles reach the top spot. The longest duration of a single at number-one was eight weeks and this was achieved on three occasions: "It's Now or Never" by Elvis Presley in 1960; "Wonderful Land" by The Shadows in 1962 and "Sugar, Sugar" by The Archies in 1969. The Beatles' song "She Loves You" became the best-selling single of all time in 1963, a record it held until 1977 when band member Paul McCartney's new band, Wings, surpassed it with "Mull of Kintyre". "She Loves You" was the best-selling song of the decade and one of fourteen songs believed to have sold over one million copies in the 1960s. The UK Singles Chart is the official record chart in the United Kingdom. In the 1970s, it was compiled weekly by the British Market Research Bureau (BMRB) on behalf of the British record industry with a one-week break each Christmas. Prior to 1969 many music papers compiled their own sales charts but, on 15 February 1969, the BMRB was commissioned in a joint venture by the BBC and Record Retailer to compile the chart. BMRB compiled the first chart from postal returns of sales logs from 250 record shops. The sampling cost approximately £52,000 and shops were randomly chosen and submitted figures for sales taken up to the close of trade on Saturday. The data was compiled on Monday and given to the BBC on Tuesday to be announced on Johnnie Walker's afternoon show and later published in Record Retailer (rebranded Music Week in 1972). However, the BMRB often struggled to have the full sample of sales figures returned by post. The 1971 postal strike meant that data had to be collected by telephone but this was deemed inadequate for a national chart, and by 1973 the BMRB was using motorcycle couriers to collect sales figures.In terms of number-one singles, ABBA were the most successful group of the decade having seven singles reach the top spot. The longest duration of a single at number-one was nine weeks and this was achieved on three occasions: "Bohemian Rhapsody" by Queen in 1975; "Mull of Kintyre" / "Girls' School" by Wings in 1977 and "You're the One That I Want" by John Travolta and Olivia Newton-John in 1978. Thirteen records were released that sold over one-million copies within the decade and "Mull of Kintyre" also became the first ever single to sell over two-million copies. In doing so it became the best-ever selling single beating the benchmark set by The Beatles' song "She Loves You" in 1963. "Mull of Kintyre" was also the biggest selling song of the decade and was not surpassed in physical sales until 1984 when Band Aid released "Do They Know It's Christmas?" (which also featured McCartney).In 1973, the British Phonographic Industry (BPI) was formed and they began certifying the sales of records at certain thresholds: "silver" (250,000 units), "gold" (500,000 units), and "platinum" (1,000,000 units). In 1977, the BPI held an awards ceremony at Wembley Conference Centre to mark the Silver Jubilee of Elizabeth II. The event cost £25,000, honoured music from the last 25 years and is considered to be the first BRIT Awards ceremony. The UK Singles Chart is the official record chart in the United Kingdom. Until 1983, it was compiled weekly by the British Market Research Bureau (BMRB) on behalf of the British record industry with a two-week break each Christmas. The BMRB used motorcycle couriers to collect the sales figures taken up to the close of trade on Saturday. This data was compiled on Monday and given to the BBC on Tuesday to be announced on BBC Radio 1 at lunchtime and later published in Music Week. On 4 January 1983, the chart was taken over by Gallup who expanded the chart from the Top 75 to the Top 100 and began the introduction of computerised tills which automated the data collection process. 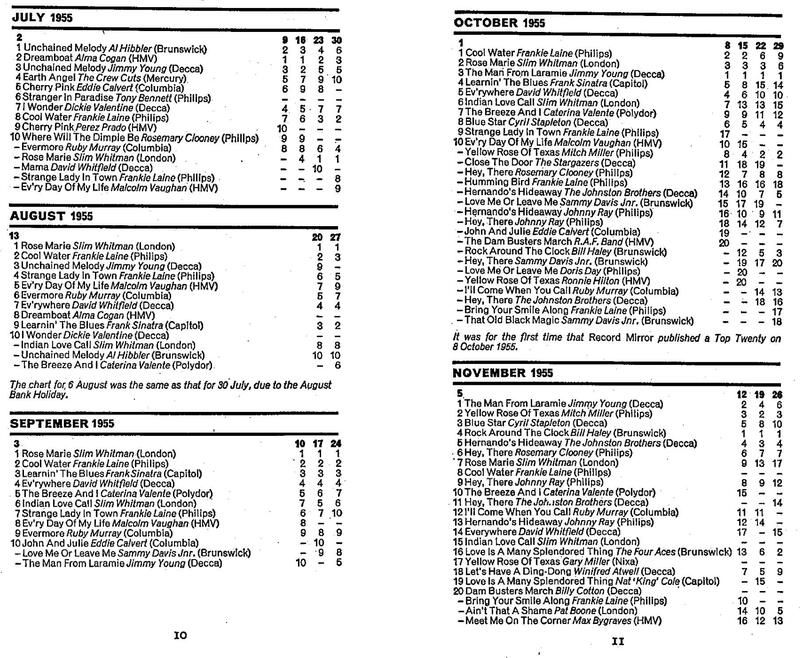 The chart was based entirely on sales of physical singles from retail outlets and announced on Tuesday until October 1987, when the Top 40 was revealed each Sunday, due to the new automated process.During the 1980s there were a total of 191 singles which took the UK chart number 1 spot. In terms of number-one singles, Madonna was the most successful single act of the decade, as six of her singles reached the top spot. George Michael had significant involvement with eight number-one singles; with two number-one singles as a solo artist, four as a member of pop duo Wham!, one as a duet with Aretha Franklin and one as a member of charity supergroup Band Aid. The longest duration of a single at number one was nine weeks, achieved by Frankie Goes to Hollywood's "Two Tribes" in 1984.The best-selling single of the decade was "Do They Know It's Christmas?" by Band Aid, selling over 3.5 million copies, and passing "Mull of Kintyre" by Wings to become the best-selling single ever. "Do They Know It's Christmas?" is currently the second best-selling song after "Candle in the Wind 1997" by Elton John.The 1980s saw the introduction of the cassette single (or "cassingle") alongside the 7-inch and 12-inch record formats and in 1987 major record labels developed a common format for the CD single. For the chart week ending 3 May 1989, chart regulations confined Kylie Minogue's song "Hand on Your Heart" to number two. Minogue would have reached number one if sales from cassette singles were included but they were sold for £1.99 – cheaper than was allowed at the time. Following the debacle the British Phonographic Industry reduced the minimum price for cassette singles to become eligible towards sales figures. The UK Singles Chart is a record chart compiled on behalf of the British record industry. Until 1 February 1994, the chart was compiled each week by Gallup – after this date, it was managed by Millward Brown, who expanded the number of sales figures sampled, and extended the use of electronic point of sale machines. From July 1998 onwards, compilation of the chart was overseen by The Chart Information Network (CIN) and it was based entirely on sales of physical singles from retail outlets – airplay statistics are not used in compiling the official UK Singles Chart. The chart week ran from Sunday to Saturday, and the Top 40 was first revealed on BBC Radio 1 on a Sunday. Record companies began making singles available to radio stations much further in advance of their release dates and making greater use of direct marketing techniques in the 1990s. As a result, the number of singles that entered the charts at number one increased dramatically, and it became commonplace for singles to enter the charts at the top and then plummet down the listing soon after.During the decade, 206 singles reached the number-one position on the chart. "Hangin' Tough" by New Kids on the Block reached number one on the first new chart of the decade, replacing "Do They Know It's Christmas?" by Band Aid II which had been number one on the last chart issued in 1989. The longest spell at the top was achieved by Bryan Adams's song "(Everything I Do) I Do It for You", which spent 16 weeks at number one in 1991, beating the record for the longest unbroken run at the top of the charts which had been held by Slim Whitman's "Rose Marie" since 1955. Wet Wet Wet and Whitney Houston also had runs of 10 or more weeks at number one during the 1990s. Although it only spent five weeks at number one, Elton John's 1997 single "Candle in the Wind 1997" / "Something About the Way You Look Tonight" sold almost 5 million copies, becoming the biggest-selling single in UK history. Cher's song "Believe" spent 7 weeks at number-one at the end of 1998 and became the biggest-selling single by a female artist in UK history. Also, Cher is the female solo artist with the most number-one singles in the 1990s (a total of three) and the female solo artist with most weeks at number one (13). The final number one of the decade was the double A-side "I Have a Dream" / "Seasons in the Sun" by Westlife. Take That and the Spice Girls share the distinction of having achieved the most number-one hits in the 1990s, with eight each. The UK Singles Chart is compiled by the Official Charts Company (OCC) on behalf of the British record industry. In the 2000s the chart week ran from Sunday to Saturday, and the top 40 singles were revealed each Sunday on BBC Radio 1. Before the advent of music downloads, it was based entirely on sales of physical singles from retail outlets, but since 2005 permanent downloads have been included in the chart compilation.During the 2000s, 275 singles reached the number-one position on the chart. Over this period, Westlife were the most successful group and music act at reaching the top spot, with 11 number-one singles. Rihanna and Jay-Z's song "Umbrella" spent 10 weeks at number one in 2007, the longest spell at the top of the charts since Wet Wet Wet's 1994 hit "Love Is All Around", which topped the charts for 15 weeks. The Internet allowed music to be heard by vast numbers of people on social networking sites such as YouTube and Myspace; it also increased piracy. This and the introduction of the UK Singles Downloads Chart in 2004 led to a decrease in record sales and a reduction in the number of copies sold of a number-one record on the singles chart. Gnarls Barkley's "Crazy" became the first song to reach the top of the charts based on downloads alone in 2006, remaining at number one for nine consecutive weeks. Physical single sales had been falling for more than a decade but digital single sales finally turned the trend around in 2008 with combined physical and digital single sales growing 33% over the previous year. Lily Allen made herself known on the Internet through her Myspace page, and following this exposure, her debut single "Smile" peaked at number one. Three years later, her single "The Fear" topped the chart for four consecutive weeks, being the longest running number one single of 2009. The first number one of the decade, the double-A side "I Have a Dream" / "Seasons in the Sun" by Westlife, was a holdover from the end of 1999. "Killing in the Name" by Rage Against the Machine was the final number one of the decade. The UK Singles Chart is a record chart compiled on behalf of the British record industry. Since 1997, the chart has been compiled by the Official Charts Company (formerly The Official UK Charts Company and the Chart Information Network) and until 2005 (when digital downloads were included in the chart compilation), the chart was based entirely on sales of physical singles from retail outlets. The UK Singles Chart originated in 1952, when New Musical Express (NME) published the first chart of singles sales. The positions of all songs are based on week-end sale totals, from Sunday to Saturday, but pre-1987 the charts were released on a Tuesday because of the need for manual calculation.Since inception there have been more than 1,350 number ones; of these, instrumental tracks (i.e. those without any lyrics) have topped the chart on 26 occasions for a total of 85 weeks. The Shadows have had the most instrumental number ones, with five between 1960 and 1963. Three other artists have had more than one instrumental number one: Eddie Calvert (in 1954 and 1955), Winifred Atwell (in 1954 and 1956) and Russ Conway (both in 1959). Calvert's track "O Mein Papa" stayed at the top of the charts for nine weeks, longer than any other instrumental single. The single "Cherry Pink (and Apple Blossom White)" has been an instrumental number one for two different artists (Calvert and Perez Prado) in 1955. To date, Martin Garrix is the most recent artist to have an instrumental number one, with "Animals" in November 2013. The death of a popular musician, and likewise, the use of a dead musician's work in advertising, often causes a sharp increase in sales of the musician's recordings and associated products; this has led to a number of posthumous number one singles in the UK and elsewhere. The phenomenon, a topic of discussion in both the media and academia, has occurred 19 times in the UK since 1959. The UK Singles Chart is a record chart compiled on behalf of the British record industry based on sales of singles in the UK. Since 1997, the chart has been compiled by The Official Charts Company and was based entirely on sales of physical singles from retail outlets until 2005, when digital downloads were included in the chart compilation. The UK Singles Chart originated in 1952, when New Musical Express (NME) published the first chart of singles sales. The positions of all songs are based on week end sale totals, from Sunday to Saturday, but pre-1987, the charts were released on a Tuesday due to the need for manual calculation.The first deceased artist to top the charts was Buddy Holly, who died in a plane crash on 3 February 1959. Three weeks later his song "It Doesn't Matter Anymore" entered the charts, and in April it reached number one. In the 1960s Eddie Cochran and Jim Reeves achieved their first and only UK number ones after their deaths, as did Jimi Hendrix in 1970. In August 1977 the "King of Rock'n Roll", Elvis Presley, died of a heart attack and his song "Way Down", which was already in the charts at the time, quickly climbed to number one. Presley achieved four further posthumous number ones in the 2000s. In 2002 his song "A Little Less Conversation", a little-known former B-side, topped the charts after being remixed by Dutch dance music producer Junkie XL for a television advertisement for Nike, which broke Presley's long-standing tie with The Beatles for the most UK number ones. Three years later three of his singles returned to the top spot when all his previous number one singles were re-issued to mark what would have been his 70th birthday.In late 1980 and early 1981 three singles by John Lennon reached number one in quick succession following his murder on 8 December 1980. His fellow former member of The Beatles, George Harrison, achieved a posthumous number one in 2002 when a re-issue of his song "My Sweet Lord", originally a number one in 1971, entered the chart at number one. In doing so, he knocked "More than a Woman" by American singer Aaliyah from the top spot, the first time that two deceased artists had topped the charts in consecutive weeks. The following is a list of songs that have charted for 50 weeks or more in total on the UK Singles Chart according to the Official Charts Company (OCC). The chart here is as recorded by the OCC, i.e. usually a top 50 from 1960 to 1978, top 75 from then until 1982 and top 100 from 1983 onwards. To be eligible the song has to be the original version whether it be by re-entry or re-issue. Remixes do not count except under certain circumstances (see "Blue Monday" below). With a total of 206 weeks, the song with the most weeks in the top 100 is "Mr Brightside" by the Killers. When only a top 50 was compiled, Frank Sinatra's "My Way" set records which still stand: 122 weeks in the top 50 between April 1969 and January 1972, 75 weeks in the top 40, and 124 weeks in the top 75, including a re-release in 1994, following a Legend Award for Sinatra at that year's Grammy Awards.The longest unbroken run in the top 100 is 95 weeks for "Thinking Out Loud" by Ed Sheeran, Sheeran's "Shape of You" amassed 94 consecutive weeks meaning Sheeran has the top two songs with the longest continuous chart runs. Engelbert Humperdinck's "Release Me" held the record run in the top 50, at 56 weeks, for over 40 years until beaten by "All of Me" by John Legend with 58 consecutive weeks in the top 50 (since passed by "Thinking Out Loud" with 63 weeks). The song with the most weeks at number 1 and in the top 10 is "I Believe" by Frankie Laine which stayed in the top 10 for 35 weeks, 18 of them at number one and a further seven at number two. Also noteworthy is "Rock Around the Clock" by Bill Haley & His Comets, the only song released in the 1950s to appear in the lists, which achieved 36 of its weeks when only a top 20 or top 30 were published. In the pre-digital era, Christmas-themed songs were often re-released in different years and several have continued to chart each year from the mid-noughties onwards. "Merry Xmas Everybody" by Slade has had 23 chart runs in 26 different years (1973–74, 1980–87, 1989–1990 and 2006–2019), while "Fairytale of New York" by the Pogues and Kirsty MacColl has reached the top 10 six times and spent a record 53 weeks in its fifteen runs in the top 20. In a similar but more modest way, since 2007, "Thriller" by Michael Jackson and "Ghostbusters" by Ray Parker, Jr. have charted at Halloween in twelve and ten years, respectively. The numbers shown are up to the chart for week ending 18 April 2019. "Tears" ("Tears for Souvenirs") is a song written by lyricist Frank Capano and composer Billy Uhr, and was first recorded by Rudy Vallee in 1929. It was made famous in a version recorded by Ken Dodd, released as a 45 rpm single in 1965. It became a No. 1 hit in the UK Singles Chart. The song also reached number one on the Irish Singles Chart. The UK Singles Chart was first compiled in 1969. However the records and statistics listed here date back to 1952 because the Official Charts Company counts a selected period of the New Musical Express chart (only from 1952 to 1960) and the Record Retailer chart from 1960 to 1969 as predecessors for the period prior to 11 February 1969, where multiples of competing charts coexisted side by side. For example, the BBC compiled its own chart based on an average of the music papers of the time; many songs announced as having reached number one on BBC Radio and Top of the Pops prior to 1969 may not be listed here as chart-toppers since they do not meet the legacy criteria of the Charts Company. "Vincent" is a song by Don McLean written as a tribute to Vincent van Gogh. It is also known by its opening line, "Starry Starry Night", a reference to Van Gogh's 1889 painting The Starry Night. The song also describes other paintings by the artist. McLean wrote the lyrics in 1971 after reading a book about the life of van Gogh. The following year, the song became the No. 1 hit in the UK Singles Chart for two weeks. and No. 12 in the US. In the US, "Vincent" also hit No. 2 on the Easy Listening chart. Billboard ranked it as the No. 94 song for 1972. The song makes use mainly of the guitar but also includes the accordion, marimba, and strings. The song was a particular favorite of the late rapper and actor Tupac Shakur, and was played to him in the hospital just before he died.Among the artists who covered this song are Karina & Ronan Keating.